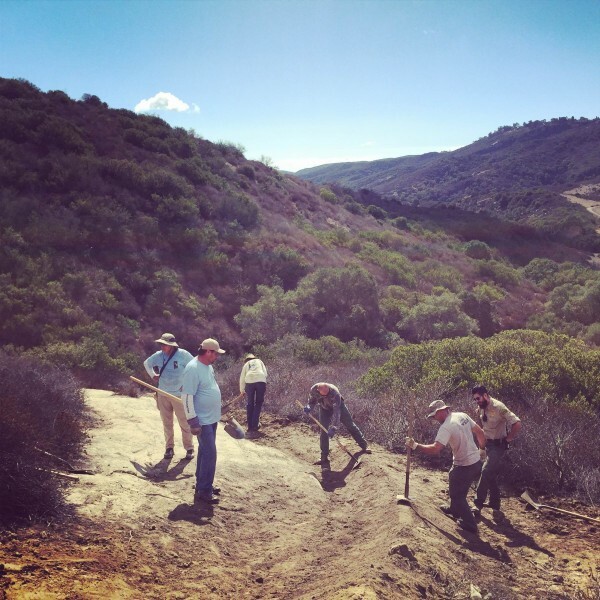 Building an erosion-abetting berm, from left, David Heuer, Rodney Ferguson, Tom Taylor, Mike Hall, Ranger Zach Salazar and Alan Kaufmann bolster the trail at Five Oaks in Aliso-Wood Canyons. With an already-distressed habitat, and not much of it left, park rangers and trail managers for Laguna Coast and Aliso-Wood Canyons wilderness parks are making haste to prepare for predicted heavy rains. The parks are being prepped for erosion. Of the 42 miles of trails, 21 miles are high-traffic, often deeply rutted, single-track paths used by bicyclists and hikers. “There’s so few miles of single-track trails and there’s a huge demand to use those trails,” said Alan Kaufmann, Laguna Canyon Foundation’s trails restoration manager. To bolster the trails for forecasted El Nino rainstorms, dirt-bagging, berm-building, water diversion and new bridges are being put into place. Without handy rocks and logs to cut from trees, Kaufmann and Mike Hall, the foundation’s trail coordinator, along with dedicated weekend wilderness warriors, are loading burlap sandbags with dry, loose dirt to sculpt the trails later. They call it dirt-bagging. “The first time it rains, all that dirt washes off the trail and it’s gone. And the trails get more deeply entrenched.” When it’s raining, and for two days after, hiking and biking are highly discouraged by the park service to prevent further erosion. In other areas of the parks, ditches, culverts and drains are now free of debris, said Barbara Norton, Laguna Coast’s head ranger. Norton supervises the 12,000 acres of Laguna Coast and Aliso-Wood Canyons, which includes the once-abundant 12-acre Barbara’s Lake, now cracked and dried from the drought. The lake is one of three there, which are Orange County’s only natural lakes. Combined with Crystal Cove State Park and Irvine Open Space, the wilderness parks stretch over 22,000 acres of the San Joaquin Hills from Newport Beach to Laguna Niguel, known as the South Coast Wilderness Park. “We’ve inspected all the bridges so they’ll be able to withstand any kind of heavy rains,” said Norton. 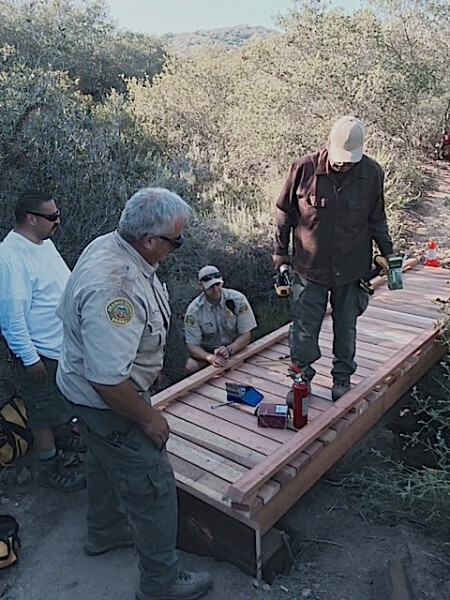 Three new wood bridges in Aliso-Wood Canyons were built by Orange County Parks, which oversees the wilderness areas. OC Parks has stock-piled emergency erosion-control materials, such as sand bags, netting, silt fencing and straw waddles, Norton said, in case more is needed. Protecting the fifth namesake oak tree on Five Oaks Trail in Wood Canyon has become another top priority project for Kaufmann and his team. Once off the trail, the oak now stands as an island due to bi-pedalers going around both sides, said Kaufmann, and its roots are becoming exposed. 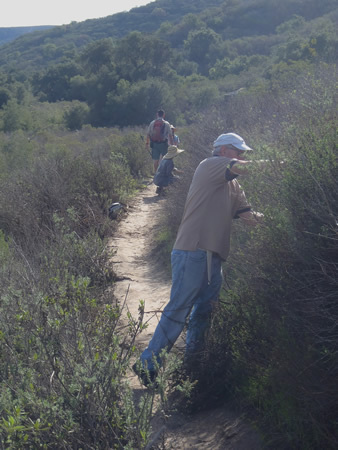 Robert Holsinger cuts brush back on Lizard Trail off Laurel Canyon in Laguna Coast Wilderness Park. In a recent five-year period, in Laguna Coast Wilderness alone, the number of park visitors tripled from 100,000 to 300,000, Kaufmann said. And some of them are a peculiar kind of wreaking crew. The local coastal sage scrub ecosystem is highly biodiverse, he explained, supporting a large variety of specialized and condition-sensitive plants and animals. And it’s valued real estate. “Because coastal scrub grows on the hillsides near the ocean, most of it has been destroyed with development so it’s also very rare now,” said Kaufmann. The Laguna Greenbelt, which encompasses the 22,000 acres that make up six different open space and wilderness parks, protects one of the largest patches of intact coastal sage scrub in Southern California. Up to 90 percent of Southern California’s coastal sage scrub has been destroyed, according to the California Coastal Commission. Nearly 100 species of plants and animals indigenous to coastal sage scrub are currently classified as rare, sensitive, threatened or endangered by federal and state agencies, including the much-heralded and threatened California gnatcatcher. Even though countywide red-flag fire warnings were issued in November, a little rain that came with two brief storms last month, goes a long way in a semi-arid climate, said Norton. The north-facing hillsides look lush, plants are growing and some are even blooming. “They can’t decide what season they’re in,” she commented. Great work you guys. Love how Laguna Beach folks pitch in to make things works with such great diligence. Kudos for all the preparation for the hopefully forth-coming rains. The Laguna greenbelt is a uniquely awesome stretch of wild in the OC. But could you please erect a 25 foot tall imperious fence to screen out those pesky coyotes that are ruining our million-dollar neighborhoods….??? It’s too taxing to bring my pets indoors, or close doors and windows, or keep my trash bins in the garage…. Screen out the wild…or are we fencing ourselves in? I still prefer the sound of baying coyotes over the rumble of fear and murder.